Born to a southern Italian farm family, the son of Grazio, a shepherd. At age 15 he entered the novitiate of the Capuchin friars in Morcone, Italy and joined the order at age 19. Suffered several health problems, and at one point his family thought he had tuberculosis. Ordained at age 22 on 10 August 1910. While praying before a cross, he received the stigmata on 20 September 1918, the first priest ever to be so blessed. 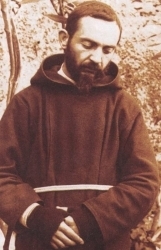 As word spread, especially after American soldiers brought home stories of Padre Pio following WWII, the priest himself became a point of pilgrimage for both the pious and the curious. He would hear confessions by the hour, reportedly able to read the consciences of those who held back. Reportedly able to bilocate, levitate, and heal by touch. Founded the House for the Relief of Suffering in 1956, a hospital that serves 60,000 a year. In the 1920's he started a series of prayer groups that continue today with over 400,000 members worldwide. His canonization miracle involved the cure of Matteo Pio Colella, age 7, the son of a doctor who works in the House for Relief of Suffering, the hospital in San Giovanni Rotondo founded by Padre Pio. On the night of 20 June 2000, Matteo was admitted to the intensive care unit of the hospital with meningitis. By morning, doctors had lost hope for him as nine of the boy's internal organs had ceased to give signs of life. That night, during a prayer vigil attended by Matteo's mother and some Capuchin friars of Padre Pio's monastery, the child's condition improved suddenly. When he awoke from the coma, Matteo said that he had seen an elderly man with a white beard and a long, brown habit, who said to him: "Don't worry, you will soon be cured." The miracle was approved by the Congregation and Pope John Paul II on 20 December 2001. Jewish priest in Jerusalem. Married to Saint Elizabeth; father of Saint John the Baptist. In his later years he was visited in the temple by the angel Gabriel who explained that Zechariah and Elizabeth would have a son. When he replied that they were too old for such a thing he was struck mute for his doubts; his speech was restored after John's birth, and a canticle he spoke is recorded in the Gospel of Luke. In the days of Herod, King of Judea, there was a priest named Zechariah of the priestly division of Abijah; his wife was from the daughters of Aaron, and her name was Elizabeth. Both were righteous in the eyes of God, observing all the commandments and ordinances of the Lord blamelessly. But they had no child, because Elizabeth was barren and both were advanced in years. Once when he was serving as priest in his division's turn before God, according to the practice of the priestly service, he was chosen by lot to enter the sanctuary of the Lord to burn incense. 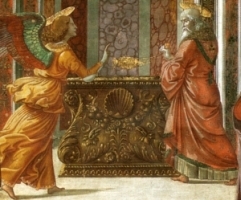 Then, when the whole assembly of the people was praying outside at the hour of the incense offering, the angel of the Lord appeared to him, standing at the right of the altar of incense. Zechariah was troubled by what he saw, and fear came upon him. But the angel said to him, "Do not be afraid, Zechariah, because your prayer has been heard. Your wife Elizabeth will bear you a son, and you shall name him John. And you will have joy and gladness, and many will rejoice at his birth, for he will be great in the sight of [the] Lord. He will drink neither wine nor strong drink. He will be filled with the holy Spirit even from his mother's womb, and he will turn many of the children of Israel to the Lord their God. He will go before him in the spirit and power of Elijah to turn the hearts of fathers toward children and the disobedient to the understanding of the righteous, to prepare a people fit for the Lord." And the angel said to him in reply, "I am Gabriel, who stand before God. I was sent to speak to you and to announce to you this good news. But now you will be speechless and unable to talk until the day these things take place, because you did not believe my words, which will be fulfilled at their proper time." Meanwhile the people were waiting for Zechariah and were amazed that he stayed so long in the sanctuary. But when he came out, he was unable to speak to them, and they realized that he had seen a vision in the sanctuary. He was gesturing to them but remained mute. Then, when his days of ministry were completed, he went home. When the time arrived for Elizabeth to have her child she gave birth to a son. Her neighbors and relatives heard that the Lord had shown his great mercy toward her, and they rejoiced with her. When they came on the eighth day to circumcise the child, they were going to call him Zechariah after his father, but his mother said in reply, "No. He will be called John." But they answered her, "There is no one among your relatives who has this name." So they made signs, asking his father what he wished him to be called. He asked for a tablet and wrote, "John is his name," and all were amazed. Immediately his mouth was opened, his tongue freed, and he spoke blessing God. for he has visited and brought redemption to his people. Daughter of Antoine Tavernier and Marie-Josephte Maurice, the youngest of 15 children. Orphaned young, and raised by her aunts. Educated by the Sisters of the Congregation of Notre Dame at the Saint-Jean-Baptiste Street school. Felt drawn from an early age to work with the poor and disadvantaged; when her brother was widowed, the 18 year old Emilie went to help him on one condition - their table would always be open to the hungry who came to the door. Married Jean-Baptiste Gamelin, a wealthy and pious apple farmer, on 4 June 1823. Mother of three sons, all of whom died as children. Widowed on 1 October 1827. Took Mary, Mother of Sorrows, as her guide for dealing with these losses, and during her time in prayer, she came to see all the poor and needy as her new family. She turned her home and inheritance into a shelter for the poor, for orphaned, abandoned or runaway children, the mentally ill, homeless, handicapped, immigrants, and destitute of any form. People began to refer to her home as the House of Providence, and she was soon after to find other residences to help and become such Houses. She worked with prisoners, and cared for the sick, brought in her family and friends to help, and led by her example. For fifteen years she worked on her own, always submitting her ideas to her priest and bishop, and completely obedient to them. In 1841, Bishop Bourget asked the Daughters of Saint Vincent de Paul to send sisters to help Emilie; the congregation agreed, but last minute problems prevented the sisters from leaving Paris. Seeing no outside help available, the bishop then called upon the faithful in his diocese, and Canadian lay women soon presented themselves to help. From this group, under Emilie leadership and by her example, the Sisters of Providence were formed in Montreal. The congregation's first vows were made on 29 March 1844 with Emilie as novice, nun, foundress and Mother Superior. The new community faced many early trials. There were always problems of funds and resoures, disease thinned their ranks, and internal dissent threatened to lose Emilie the support of her bishop. But the group survived. There were 50 sisters at the time of Emilie's death, less than eight years after the group's formation. Over 6,000 Sisters have joined the order over the years, today working in Canada, the United States, Chile, Argentina, Haiti, Cameroo, Egypt, the Philippines and El Salvador. At her beatification recognition, Pope John Paul II presented her as a model for all by her life dedicated to the most needy. Distant relative of Saint Columba. Monk at Drunhome, Donegal, Ireland. Abbot of Iona in 679. President-general of all the Columban houses in Ireland. Evangelized throughout Ireland. Adamnan gave sanctuary to Prince Aldfrid when the throne of Northumbria was in dispute following the death of King Oswy. When Aldfrid became king in 686, Aldamnan secured the release of all Irish prisoners taken in the conflict, and visited the monasteries of Wearmouth and Jarrow. 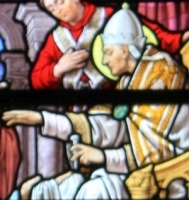 Persuaded by Saint Ceolfrid, Adamnan adopted the Roman calendar for determining Easter, and then worked for the adoption of many Roman liturgical practices in the Celtic region. This so displeased some brother monks at Iona that from 692 on, Adamnan rarely went there. Attended the Council of Birr and Synod of Tara in 697 at which he helped enact the Canons of Adamnan, laws that helped protect civilian and clerical populations in areas at war, prohibiting the murder or enslavement of non-combatant women and children. A noted scholar, he wrote the biography Life of Saint Columba in the late 680's, a work that survives today (see links below). He also wrote De locis sanctis (On the Holy Places), a popular description of Palestine based on the notes of and interviews with the Frankish pilgrim bishop Arculf. Renovated and revitalized the monastery of Raphoe, Ireland. Baptized at the age of one day, Jozef was orphaned at age six. He was educated at a Pallottine school in Wadowice, Poland, and in 1935 at age 18, he became a Pallottine novice. Ordained a priest on 7 April 1941, he started his three year ministry in a Poland that was under Nazi occupation and in the middle of World War II. At the beginning of the Warsaw Uprising on 1 August 1944, Father Jozef served as chaplain to the insurgents, staying in the combat areas to care for and bring the sacraments to those fighting and those who were trapped in the city; given a chance to escape the city, he gave up his seat to an injured man. On 22 September 1944, he went to the Nazi authorities to try to negotiate a settlement and save as many lives as possible. Instead of working with him, the Nazis captured, beat and murdered him for being a priest. Martyr. Born a slave and trained as a tailor. He early felt a call to the priesthood, but, being a slave, had to have special dispensation to enter seminary, and was shunned by fellow seminarians and the parishioners of his first assignment in the diocese of Campanha, Brazil; his parishioners even refused to accept Communion from his hands. He persevered in his vocation, always patient, always forgiving, always dedicated to the faith and the priesthood, and eventually won the people over to the point that there were protests when the diocese considered transferring him to another parish. Grandson of the Tlaxcala noble Xicohténcati, and heir to his title and estates. Convert to Christianity. One of the Three Child Martyrs of Tlaxcala. Descendant of the Old Testament patriarch, Aaron. Wife of Zachary, temple priest. Relative of Mary. Mother of Saint John the Baptist, becoming pregnant very late in life. She was the Elizabeth that Mary visited soon after the Annunciation. Described in the Gospel of Luke as "righteous in the eyes of God, observing all the commandments and ordinances of the Lord blamelessly." Deacon of the church of Miseno, Italy. Imprisoned and martyred in the persecutions of Diocletian. First century convert in Iconium, brought to the faith by the preaching of Saint Paul the Apostle; her family threw her out. She dedicated herself to God, became a spiritual student of Saint Paul, and assisted him in his travels and works. She was thrown to wild animals as a Christian, but survived; she was sentenced to burn at the stake, but managed to escape. In her later years she retired to live as a hermitess. Because of her sufferings for the the faith, she is considered a martyr though she survived the attempts to kill her. She is mentioned the Prayers for the Dying. She was the subject several fantastic apochryphal writings in the early Church. Raised in a pious family. Spiritual student of Saint Albert Chmielowski. Co-foundress of the Sisters of the Third Order of Saint Francis Servants of the Poor (Albertine Sisters). Known as a mystic with a great concern for those who are suffering. As superior of the Sisters she founded hospices for the sick and poor. Lay woman who, against her will, married Benedict dall'Oglio in order to please her family; she spent 30 happy years with him, both of them being known for their Christian lives. Widowed, she devoted herself to charity in her few remaining years. Those who knew her considered her a saint in life, a public cultus spontaneously developed, and even the future Pope Benedict XIV spoke for her beatification Cause. Second Pope, and the first to be chosen in Rome, Italy. According to Irenaeus, he is the Linus mentioned by Saint Paul in 2nd Timothy 4. His name is mentioned in the prayer "Communicantes" in the Canon of the Mass. Traditionally honoured as a martyr, though there is no certain documentation of this. Nothing else is known of his life, and ancient documents about his papacy have proven to be inaccurate or apocryphal. Seminarian in Reims, France. Ordained in 1586. He returned to England to minister to covert Catholics, hiding under the name William Flowers. Imprisoned and executed for the crime of priesthood. Martyr. Son of a pagan tribal chief. Convert to Christianity. Educated at the first Franciscan school in Tlaxcala. Beaten and then martyred by order of his father for refusing to deny his faith. One of the Three Child Martyrs of Tlaxcala. Servant of Blessed Antonio. Convert to Christianity. One of the Three Child Martyrs of Tlaxcala. Cistercian Benedictine monk at Clairvaux, and one of Saint Bernard of Clairvaux's most beloved disciples. Founder and abbot of the abbey of Our Lady of Cherlieu in the diocese of Besancon, France. At Saint Bernard's request, Guy revised the Cistercian liturgical chant. Eighth-century spiritual student of Saint Guthlac and Benedictine hermit at Crowland Abbey in England. Sixth century sacristan of the church of Saint Stephen, Ancona, Italy. Spiritual student of the Apostles. Group of Christians deported from Syracuse, Sicily by invading Saracens and sent to North Africa where they were tortured and executed for their faith. Martyrs. The names that have survived are Andrew, Antony, John and Peter.